Love them or hate them, instinctually, my team knows Facebook ads work to drive sales and engagement, promote reach and garner impressions all while telling a story about our brand. When Jon asked me to guest post for him and compare our success with two styles of Facebook Ads used by Sierra Trading Post, I nearly leaped at the chance. It was the perfect excuse to open Pandora’s Box of Ad Data and offer some hard facts to a timeline of ad spend. For two years, I’ve had a dedicated ad budget for Facebook. I’ve learned that sending people away from Facebook to our eCommerce site isn’t effective, but using Sponsored Stories to attract fans and, later, Promoted Posts to enhance engagement with those fans is successful. When Facebook Offers were unveiled, we gave them a shot, too. 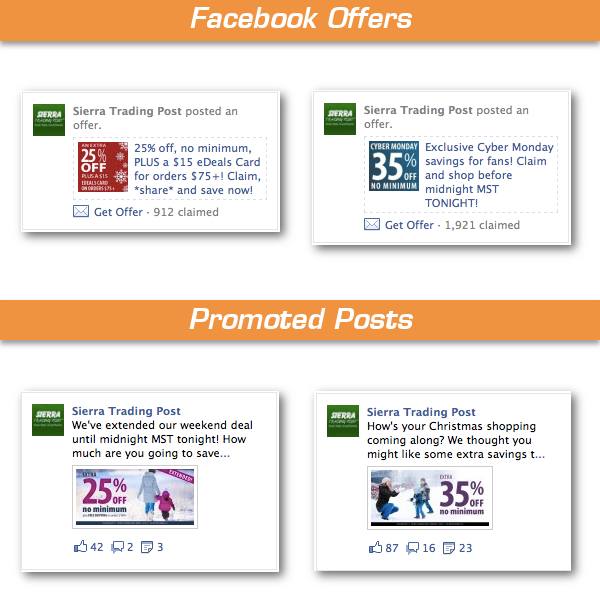 Throughout the fourth quarter of this year, we’ve been experimenting with Facebook Offers and Promoted Posts – posts in which we offer a coupon when users click through a shortened link. Which was more successful for us, Jon wondered. Offers or Promoted Posts? To be fair, our test isn’t exactly equal. We did seven Offers and just four Promoted Posts from October through December. Some time frames were longer – they ranged from a coupon being valid just until midnight MST that same day to three days. Consider, too, that Q4 is an anomaly. People shop more during this time, and the competition is fierce! All of that skews our results a bit, but there are still learnings in our spreadsheet. Generally, we learned that an Offer or Promoted Post that was valid for three days or so performed much better than those that expired at midnight. Not a shocker, right? We learned, too, that including the words “Save 30%” in creative attached to a Promoted Post resulted in an ad being approved and then disapproved by Facebook (but it still made money for us, yo!). It would seem that Facebook wants us to use Offers for driving sales, but did the Offer perform favorably? Bottom line: During our test, we saw an ROAS (Return on Ad Spend) of 210 on Offers – more than 10 times the ROAS on Promoted Posts (we calculated cost of goods sold in our formula, by the way). The result is a ratio, like 210.0. In this example, for every dollar we spent, we made $210.00. We spent less on those Promoted Posts, saw many fewer impressions but enjoyed a higher CTR of 1.97 percent. For Offers it was just .3 percent. 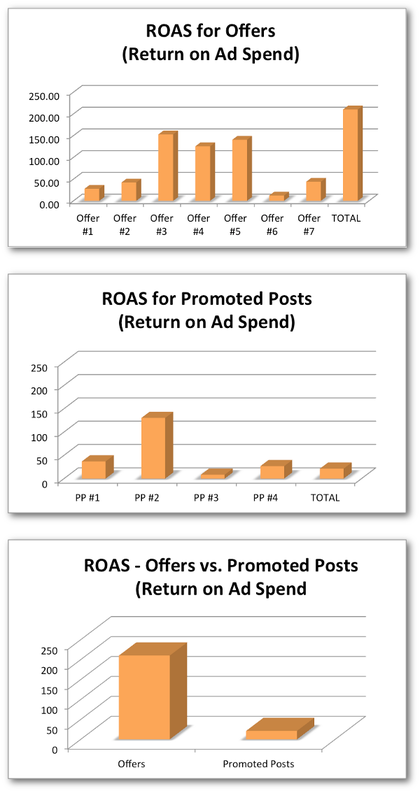 The Offers outperformed Promoted Posts on revenue, but there were fewer of them and the Promoted Posts were usually valid for just 14 hours. But here’s a funny observation. In one of my December posts, I created an Offer. Then I missed the opportunity to say I’d like to promote it with ad budget later (it’s a teeny box, but it does allow you to schedule an Offer and ad spend simultaneously). So the post functioned like an Offer, and I wasn’t really sure what to make of the data for that particular post, especially when Facebook called it an Offer in its Page-level download and it represented more than 90 percent of my spend! It wasn’t a revenue all-star, though it didn’t do too badly. 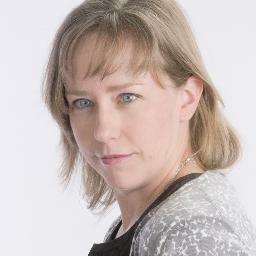 It was the best revenue generator of all the Promoted Posts, bringing in 22 percent of all Promoted Post revenue. I analyzed it as a Promoted Post, but it made me wonder about the distinction Facebook is actually making between the two ad styles. Are they really all that different? It was kind of a rub, actually. In making that mistake, I also realized Facebook jacked its pricing around wildly. The minimum I could spend was, at first, $1,600. An hour later, it was $200. Three hours later $500. That’s when I resolved to keep helping my small-business-owning friends with their low-budget Facebook campaigns. In all of this, I was freaked out by the ROAS –- they would be considered incredibly successful if we could only decide what was a fair analysis. In the end, we decided to parse out Paid and Organic Impressions (gathered from post-level Insights) and weight the formula. So, what did we learn in this analysis? We need to keep doing Offers. And we need to keep understanding traditional online marketing techniques for analysis and figuring out where and when it’s appropriate to apply them to social. And we need to look at our ROI so we can tie organic and paid pieces together for social and understand the real effect of ads on our business. These are all good challenges for 2013, and it’s one my team will be taking on like the ever-learning and always-experimenting pros we are. Juliette Rule manages social media and a team of four socializers for Sierra Trading Post, a top 100 Internet retailer based in Cheyenne, Wyo. The brand embraced social fully three years ago, and shares killer contests and deals you wouldn’t believe on Facebook, Twitter and Blog, while handily sharing fabulous how-tos on its YouTube channel as well.